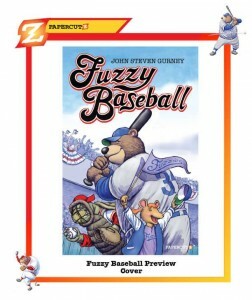 Another new full-color comic from the Previews kid-friendly special feature is Fuzzy Baseball, written and illustrated by John Steven Gurney. “It’s the game everyone has been waiting for-The Fernwood Valley Fuzzies Vs. The Rocky Ridge Red Claws! The Fuzzies, featuring such all-star players as Jackie Rabbitson, Sandy Kofox, and Hammy Sosa, are ready. So are the Red Claws, with players like Gator Gibson, Stetch Giraffolo, and Fernado del Toro. Together they’ll make this the greatest game ever played between the two longtime rivals. And you have a front row seat at Fuzzy Field!” It’s coming from Papercutz in late April. You can preview the first volume over at their web site.